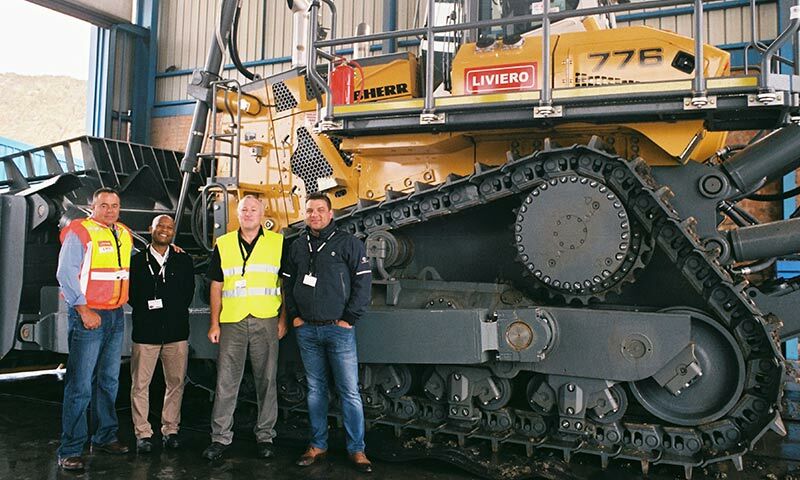 Pictured with Liviero’s new Liebherr PR 776 dozer are (from left to right) Louis Du Plessis (Liviero), Tendayi Kudumba (Liebherr-Africa), Richard Edwards (Liebherr-Africa) and Nehan Deysel (Liviero). 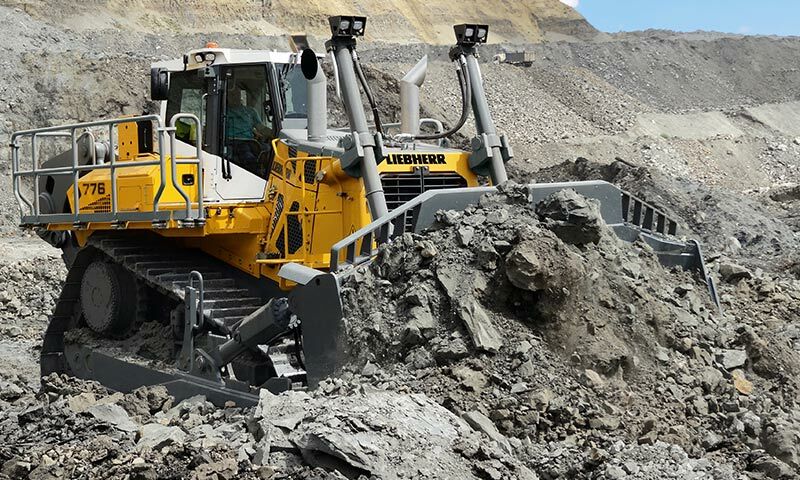 Liviero is putting the first Liebherr PR 776 dozer in South Africa through its paces at its Vanggatfontein Colliery mine site. Multi-disciplinary contractor Liviero has taken delivery of the first new Liebherr PR 776 prototype crawler tractor to arrive in South Africa. This is the world’s first hydrostatically powered crawler tractor in the 70 tonne (t) category, and it joined Liviero’s fleet ahead of its global market launch at bauma 2016. Liviero and its mining clients will reap the benefits of the PR 776’s lower fuel consumption. An intuitive joystick control has maximised operating comfort, while safety has been enhanced by a design that offers an excellent view of equipment and the surrounding area. Liebherr handed over Liviero’s new acquisition at a celebration at Vanggatfontein Colliery, where Liviero Mining is working in partnership with client Keaton Energy, and has sound production results over the years. 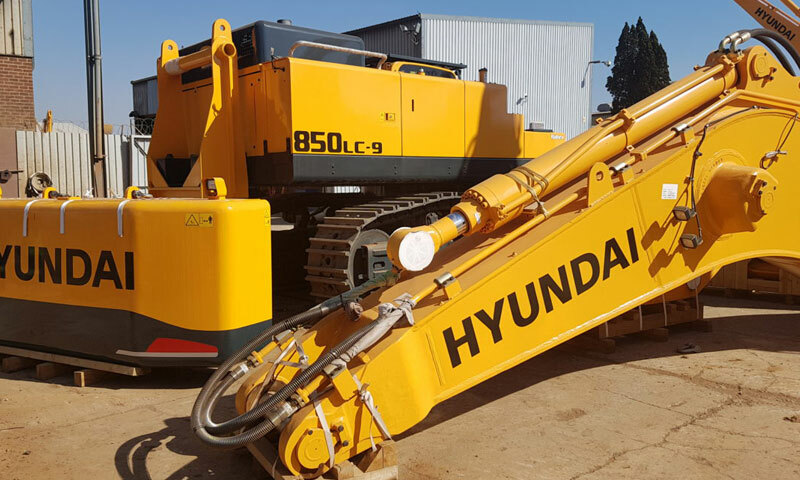 “We are delighted to add this modern, high-performance new machine to our fleet at Vanggatfontein. It reflects Liviero’s commitment to investing in state-of-the-art equipment that can enhance our performance and give our clients a competitive edge,” comments Liviero CEO Neil Cloete. The machine’s competitive edge is its hydrostatic travel drive, which is said to set it apart in this class size. 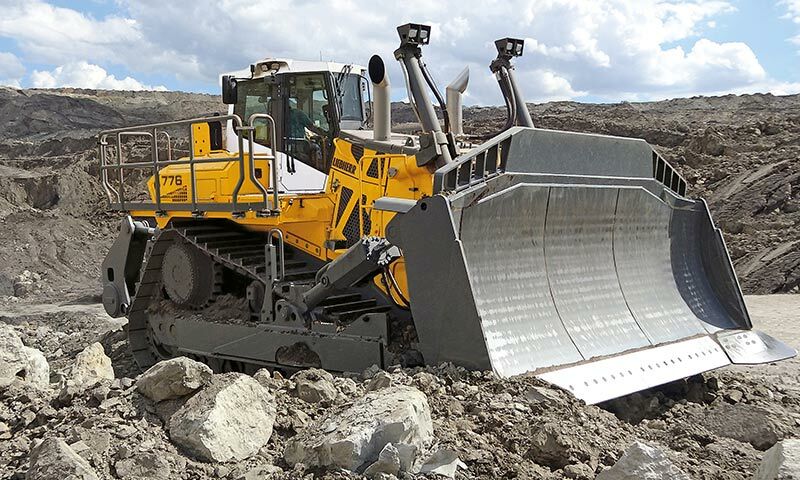 The same drive concept is already used on all Liebherr’s crawler dozers, but generally hydrostatic transmissions are common in the under-130hp class. For anything above 160hp, most other OEMs switch to the torque converter or mechanical drives. Liebherr’s line-up is 100% hydrostatic right up to its latest and biggest offering, the 74t PR 776. 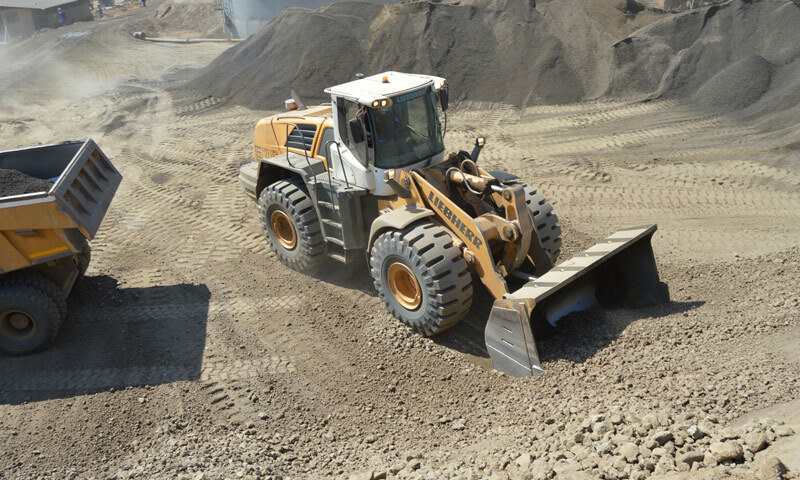 The principal benefit of a hydrostatic transmission on a dozer is the absence of gears, resulting in seamless operation, uninterrupted power flow and infinitely variable speed control, says Shanna Beets, EMT & Tender Coordinator at Liebherr Africa. In split dozing applications the hydrostatically driven dozer automatically slows down as the blade loads up and gains momentum as the load sheds. In split dozing applications, the benefits of a hydrostatic driven dozer are well documented, Tendayi Kudumba, Divisional Manager of Earthmoving Technology (EMT) at Liebherr Africa tells Equipment Africa. The hydrostatically driven dozer automatically slows down as the blade loads up and gains momentum as the load sheds off. Because the operator doesn’t have to shift gears, there isn’t the usual slight loss of momentum due to the shift. The hydrostatic drive concept also offers the benefit of dynamic braking. By simply easing off the throttle, hydraulic pressure within the system brings the machine to a complete halt. 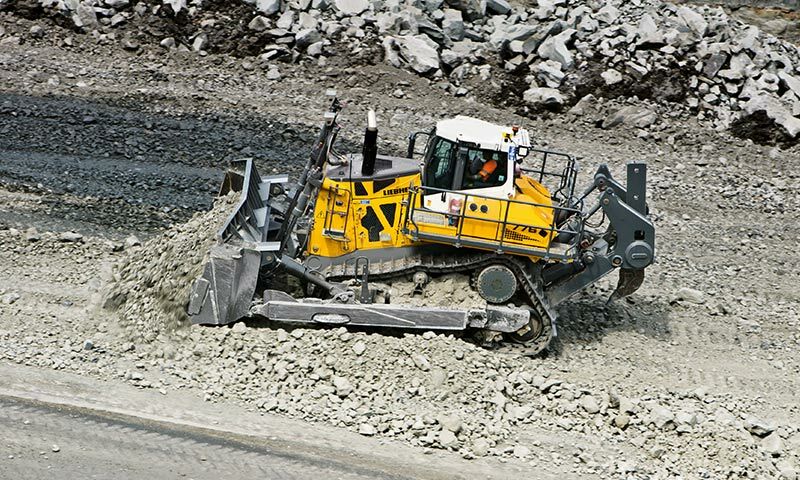 Alan Hosmer, National Sales Manager at Liebherr Africa, says the PR 776 doesn’t come with a braking system to turn. In live power turns, even when pushing a full blade of material, the hydrostatic drive is said to guarantee uninterrupted performance within the turn. The PR 776 comes with larger blade capacities of 18m³ (semi-U blade) or 22m³ (U blade). On slopes, the system also ensures that the machine doesn’t roll backwards. Unlike torque converter driven counterparts, which not only have a deceleration pedal, but also come with a brake pedal that requires the attention of two feet, the hydrostatically driven PR 776 needs only one foot for the deceleration pedal. Another big plus of the hydrostatic drive concept is the optimisation of pressure flow, declares Hosmer, noting that hydraulic servo pressure is based on-demand according to the task at hand. If, for example, the full feed of pressure is not required when operating, it is automatically returned, providing sound fuel savings in the process. Another key advantage of the hydrostatic drive, as Beets says, is that when working in restricted spaces, it offers the crawler tractor sound manoeuvrability with continuous power on both tracks. 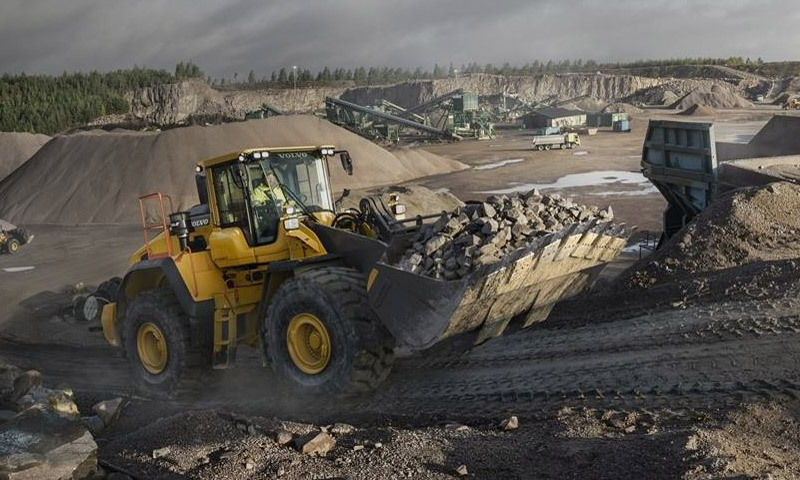 With its maximum operating weight of 74t, the PR 776 is ideal for mining and quarrying applications. Like all other Liebherr Generation crawler dozers, the new PR 776 also comes with the ECO function as standard, which allows the operator to choose between high performance and maximum efficiency for a particular task, providing greater fuel savings. An additional fuel saving feature is the proactive power control system, fitted standard on all Liebherr’s 6th generation crawler tractors. Internal engine and external machine parameters are recorded, such as the current deflection of the joystick. If needed, the engine power is automatically increased for a brief moment based on the current requirement. In addition to responding more rapidly, this is said to offer the machine a significant increase in performance potential and pulling power, as well as a higher reverse speed. Combined, the Liebherr engine management system, the Liebherr Power Efficiency System and the hydrostatic driveline, work in union to allow for mastering and optimisation of all equipment systems and processes to maintain constant engine speed, increase overall machine efficiency and significantly reduce fuel consumption. Another key advantage of the hydrostatic drive is that when working in restricted spaces, it offers the crawler tractor sound manoeuvrability with continuous power on both tracks. In the past, dozers had a reputation for being one of the more difficult earthmoving machines to master. However, today with the right technology, it has become one of the easiest to steer around. A case in point is the new Liebherr PR 776, which Kudumba notes comes with a host of features aimed at operator comfort. This minimises operator stress and strain, translating into better productivity. One of the focal design points of this machine is simple and safe operation. Hosmer points out that the single multifunction joystick has all operating and steering functions at the palm of the operator’s hand, with only one electronic input element. 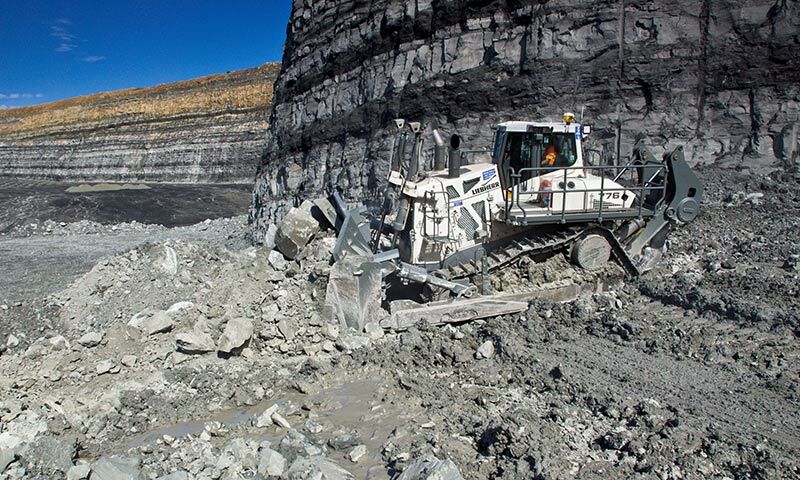 This operating concept was rigorously tested by Liebherr-Werk Telfs and is a notable innovation for the 70t size class, especially in mining applications where long working hours may be the order of the day. The PR 776 offers a great working environment for the operator as all controls and instruments are carefully arranged for easy access. All key functions and machine settings can be adjusted via the touchscreen display, such as ECO function parameters, automatic engine speed reduction, travel drive response and steering, as well as standard safety functions such as the rear view camera. 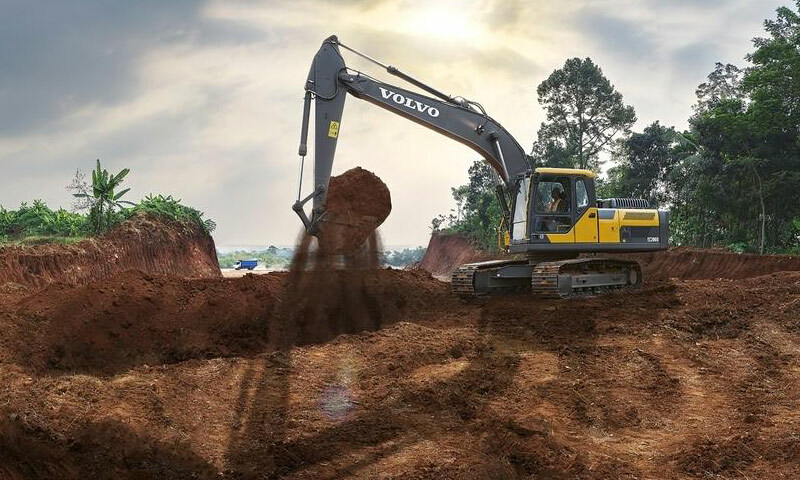 For safety reasons, the design of the operator cab offers all-round visibility of the worksite, blade and rear ripper. This is complemented by an optional GPS navigation system which allows for easy visualisation of both work progress and the surrounding. Meanwhile, forward visibility is completely unobstructed as the exhaust system and lifting rams are positioned behind the A-pillars. The side view of the working area is also clear and unobstructed by the extended work platform. Equipment Africa says: Liviero has always associated itself with premium equipment brands and it is therefore no surprise that it should be one of the first to explore the latest offering from Liebherr. We look forward to following the performance of the machine on site.